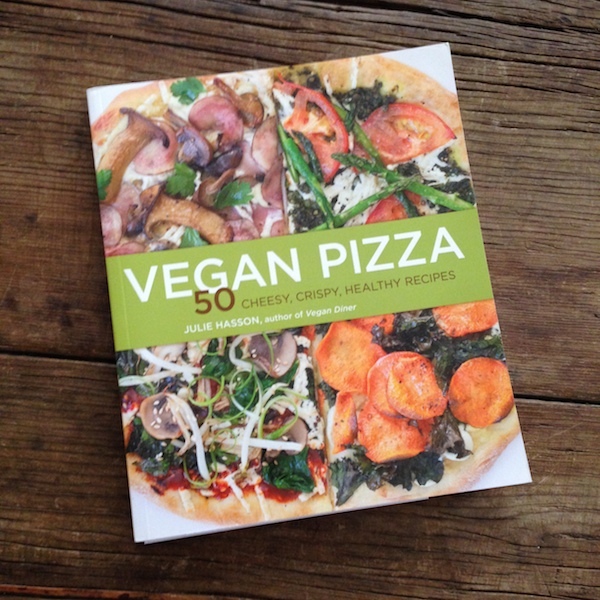 Today I’m reviewing Vegan Pizza: 50 Cheesy, Crispy, Healthy Recipes By Julie Hasson. 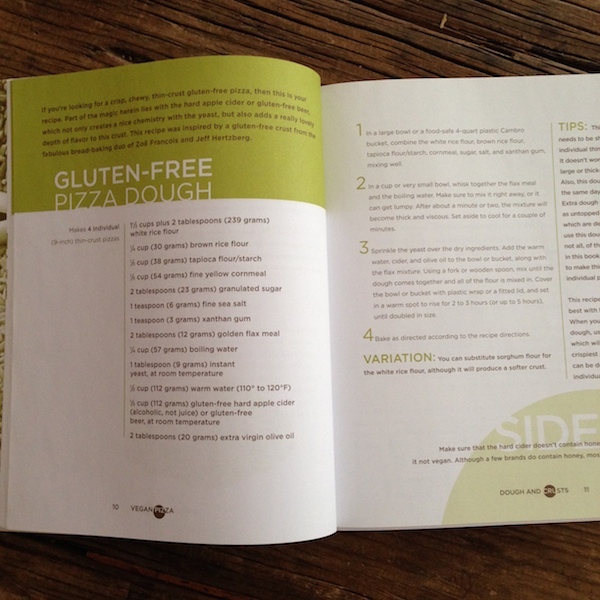 The book contains 50 recipes for vegan pizza “cheeses” and a variety of toppings and sauces. She does feature one gluten-free crust as well. The book is designed in a style I’ve seen with a few other publishers of vegan books: matte-finish paper, brown ink, green pages and imagery. The fonts are all sans serif. I am not a huge fan of food images that are screened back on green. I think they are far more appealing as either black-and-white or sepia-toned. I know it’s a way to make the printing less expensive. Hasson offers an introduction that includes setting up for making pizza (pantry, equipment, useful tips). Chapters include Dough & Crusts, House-Made Meats, Cheesy Sauces and Spreads, The Classics, Farmers’ Market Pizzas, Not Your Usual Suspects, Global Flavors, Sweet Pizza Pies. 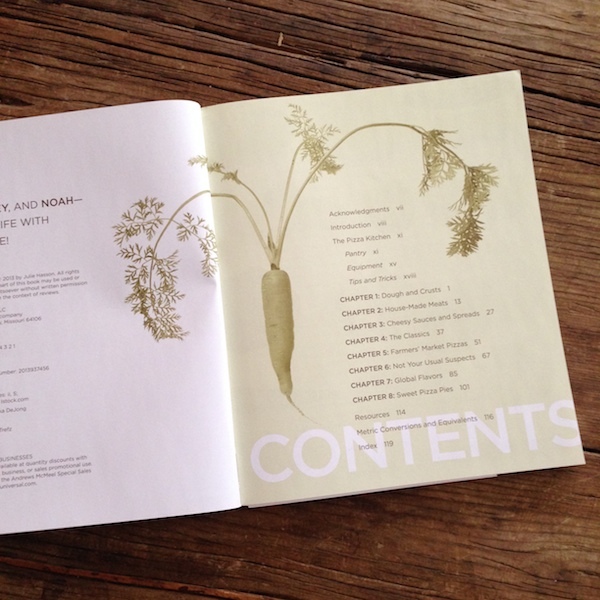 The book uses photographs of ingredients like grains, kale, or tomatoes, printed with a green filter (not in full color). As mentioned above, for many foods this makes them look unappealing. The cover photographs of four pizzas look great. The gluten-free pizza dough includes either hard apple cider or gluten-free beer, which sounds very interesting. “Meats” include pepperoni crumbles, burger crumbles, and garlic soy curls. (All contain soy.) Here are some of the other recipes: cheddary cashew cheese sauce, garlic sausage and onion pizza, smoky wild mushroom and potato pizza, peanut barbecue pizza, bibimbap pizza, coconut caramel pizza. If you’re a big pizza fan and don’t have eating restrictions beyond being vegan, this would be a terrific book to add to your collection. Although a gluten-free crust recipe is provided, the other recipes do not indicate whether they are gluten-free or not. Nutritional analysis is not provided, which would be helpful for low-sodium eaters. Required FTC disclosure: I received one copy of this book from the publisher for the giveaway on October 31st. Interesting! I love experimenting with different flavor combinations and ingredients for pizza. I don’t think I would ever eat pizza without cheese (but that’s just me, and I am not vegan! ), but I would definitely use the different ideas from this book.